If engaged couples are planning their honeymoon in advance, why not spend the honeymoon in Napa Valley? This would a great honeymoon location especially if both honeymooners also happen to love wines! The Californian Wine Country is a perfect romantic retreat, with its breathtaking countryside scenery, excellent world-class cuisine, and lots of wineries. It’s likely that honeymooners will choose Napa wineries with the perfect romantic setting. Each of the wineries offers a unique experience for the wine-loving honeymooners. Sterling Vineyards, for instance, offers a tram ride which offers a fantastic view of the Napa Valley, especially on a clear day. Opus One in Oakville has a stunning combination of American and European architecture, featuring a rooftop deck which offers fantastic views of the Napa Valley, and varietals which include current vintage (Cabernet Sauvignon with Merlot), Cabernet Franc and Petit Verdot. Domaine Carneros has a French-style villa with stunning views of the vineyards, rare table service, and the best sparkling wines in the region. This is because it’s partly owned by a real French champagne producer, Taittinger. Other than visiting beautiful wineries and vineyards, honeymooning at the Napa won’t be the same without dining out. You can go at any restaurant in Napa depending on your taste. But if you want a restaurant whose ambiance can set your hearts (and bellies) aflutter, we recommend the French Laundry in Yountville for its French-influenced American cuisine, Auberge du Soleil in Rutherford where you can have a dinner by the deck and watch the romantic sunset, or The Lakehouse which is located at an idyllic setting at Calistoga Ranch. For an introduction of Napa’s artisanal products and more food-tripping, head to Oxbow Public Market. You can also buy provisions to take home such as artisanal cheese, chocolates, and cured meats. Also inside Oxbow, you can have coffee at the Ritual Coffee Roasters, Gott’s Roadside for the burgers, Hog Island Oyster Bar for the best oysters in Bay Area, and Kara’s Cupcakes for the sweet ending. If you want to combine great cuisine and sight-seeing into rolled into one, take a ride inside the Napa Valley Wine Train. This lovely restored antique train is also a mobile restaurant, where delicious high-end cuisine and fabulous interiors await you for a grand ride amongst the vineyards. Evoke you and your spouse’s senses after a day of sightseeing, dining, and shopping by relaxing at one of Napa Valley’s world-class spas, resorts, and wellness centers. The city of Calistoga, the home of the “Old Faithful” geyser of California, is also famous for its hot springs and spas where you can enjoy mud baths and the best massages. A hot air balloon will be the highlight of your honeymoon in Napa Valley! Witnessing the sunrise and the waking Napa fields while gently floating in a hot air balloon might well be a symbolic way to celebrate a new chapter of your lives — your married life. View the gorgeous 360-degree view of the Napa Valley, with the neat rows of grapevines, the deep valleys and the rolling hills, as well as the sun rising from the horizon. Balloons Above the Valley (BATV) will make your honeymoon extra special. 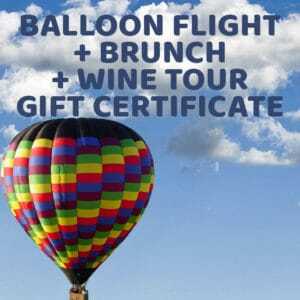 Our Sunrise Balloon Flight & Champagne Brunch will bring your romantic sojourn to new heights! Not only will you and your new spouse get to enjoy uninterrupted views of the Napa Valley, but you will also enjoy a delightful, pre-flight breakfast and a post-flight brunch celebration (with sparkling wine), along with the other guests. If you want “you-and-me-only” moments, ask about BATV’s “Exclusive Flights” package. In this option, you and your spouse will get to enjoy an exclusive flight (the only other person in the basket is the pilot) as well as a private table at the post-flight celebration. The gorgeous Wine Country has created a niche in the hearts of honeymooning couples. To make your moments extra special, let Balloons Above the Valley be a part of your honeymoon in Napa Valley — for a closer, more intimate and more memorable celebration of the newly-married life.